China is increasingly viewed by the United States as a full-spectrum adversary. Much attention this year will focus on the power struggle between the US and China. A closer look at the US president’s 2017 trade policy agenda and its ensuing initiatives reveals a pattern. Obama’s trade policy favoured multilateral, comprehensive and ultra-regional deals such as the failed Trans-Pacific Partnership (TPP) agreement, and the frozen Trade in Services Agreement (TiSA). Whereas Trump pushes for bilateral and more targeted deals. The US boasts it has more than ten Trade and Investment Framework Agreements (TIFAs) with Asian economies. Essentially, these agreements may form the basis for future FTAs or Bilateral Investment Treaties. China’s goal is to use the Regional Comprehensive Economic Partnership (RCEP) negotiations to accelerate its major Asian infrastructure projects. The most notable of these is the Belt and Road Initiative and the Asian Infrastructure Investment Bank. This initiative promises to compete with the Western-centric World Bank and Japan-led Asian Development Bank. Adding to this is a recent US trade report which urged allied economies to coordinate an anti-dumping action on China’s industries. This is designed to protect trade secrets and intellectual property rights. From an Australian perspective, Donald’s Trump Asian tour could hardly be more important. Not for several presidential cycles, and perhaps not since Richard Nixon’s visit to China to initial the Shanghai Communique in 1972, has a visit to Asia assumed such significance – and one that is potentially fraught. US President Donald Trump leaves Washington late this week for a 13-day tour of Japan, South Korea, China, Vietnam for APEC, and the Philippines before returning home via Hawaii. In these two weeks, Trump will be exposed to an Asia-Pacific – or Indo-Pacific – that is undergoing a wrenching transformation against a background of risks to a “long peace”. It is one that has survived more or less intact since the end of Korean War, leaving aside Vietnam. From an Australian perspective, the Trump Asian tour could hardly be more important, given Canberra’s challenge of balancing its security and economic interests. An American wrecking ball in the region is the last thing Australia needs, especially one that risks mishandling a North Korean nuclear threat to regional security. In this regard, Trump’s every utterance, including his contributions to social media, will be scrutinised over the next two weeks by a nervous region. What is striking about this latest period is the velocity of a geoeconomic shift that is challenging long-held assumptions about US authority in the regional power balance. Seemingly, the Asia-Pacific region can no longer take for granted a US stabilising role. As China’s power rises, so does US leverage ebb. This is not a zero-sum game. The question is how pieces of a kaleidoscope will settle, if indeed they do. Trump’s Asia tour will enable an assessment of the extent to which the US will remain a reliable regional security partner and a participant in various regional forums. Former president Barack Obama talked about a “Pacific Century”, involving as it did a US “pivot” to the Asia-Pacific. Trump has not used such terminology. Indeed, one of his first executive acts was to undo work that had been put into US participation in a region-wide trade initiative – the Trans Pacific Partnership (TPP) – aimed partly at countering China’s geoeconomic dominance. This was a hasty, ill-considered decision that sent all the wrong signals about US commitment to building an Asia-Pacific trading and security architecture. The other 11 TPP signatories, including Australia, are pressing on with attempts to finalise the trade liberalising protocol, but US absence significantly lessens its weight. It may be unrealistic – given Trump’s bellicose “America First” pronouncements on trade – but Washington would do its regional credibility no harm if it reversed itself on TPP. On a visit to Australia last month to launch the first volume of his memoir – Not For The Faint-Hearted – former prime minister Kevin Rudd warned of the risks of the end of a period of relative stability. His warnings were based on a paper produced by the Asia Society Policy Institute – Preserving the Long Peace in Asia – of which he is president. In a contribution to the East Asia Forum, Rudd asked the question: how can we save Asia’s “long peace” in light of North Korea’s attempts to develop a ballistic missile nuclear capability? This has been a crisis long in the making, beginning with the Soviet training of North Korean nuclear scientists and engineers after the second world war, the north’s expulsion of International Atomic Energy Agency inspectors in 2002, and the subsequent series of ballistic and nuclear weapons tests. The uncomfortable truth is that for the last quarter of a century, the international community has simply been kicking the can down the road. And now, at one minute to midnight, everyone is scrambling on what to do about it. In Rudd’s view, the Asia-Pacific needs to develop a security understanding – like the Helsinki Accords in Europe – to deal with security challenges, including North Korea and, more broadly, territorial disputes that threaten regional stability. His preferred option is to bolster the East Asia Summit (EAS) as a regional forum to promote peace and stability. He makes the valid point the EAS has, potentially, the regional heft to undertake such a stabilising role. Disappointingly, Trump is not planning to stay in the Philippines an extra day for this year’s EAS gathering. It might have been time well spent. Membership, including the ten nations of the Association of South East Asian Nations, plus China, South Korea, Japan, India, Australia, New Zealand, Russia and the US, means all the main Indo-Pacific players are participants. The EAS has the mandate to expand its activities in the security domain. The Kuala Lumpur Declaration of 2005 is clear about this. Furthermore, members of the EAS have all signed the Treaty of Amity and Co-operation, which commits partners to peaceful dispute resolution. Moreover, the EAS uniquely has all necessary players around the table. What is required in all of this is American leadership, but as things stand there is little sign of Washington possessing an overarching vision of where it might take the region in the next stage as China continues to expand its power and influence. In this regard it is hard to disagree with a Lowy Institute paper – East Asia Policy under Trump. It identified a serious case of drift in American engagement with the region under a president whose knowledge of – and interest in – the Asia-Pacific appears limited at best. US policy on East Asia is thus on autopilot, which presents two distinct risks. First that of a crisis, whether created by the president or events. The US faces challenges to its economic leadership from Beijing’s Belt and Road Initiative, a program of massive infrastructure investment that will enmesh the economies of China and its Asian neighbours, challenges from Chinese attempts to shape regional institutions to its advantage, and to shape a narrative of the region’s future that puts Beijing at its centre. It also faces challenges from an increasingly capable Chinese military. All this in a region that is becoming increasingly illiberal – and doubtful of US staying power. This is a fairly bleak assessment of a US ability to engage the Asia-Pacific constructively in this latest period. In fairness to Trump, he remains on a steep learning curve. How all this will play out is anyone’s guess. What is the case is there is no more important stop of Trump’s itinerary than his visit this coming week to China to engage the newly reinforced ruler Xi Jinping. The China talks, in the lead-up to APEC in Vietnam, are the linchpin of Trump’s Asian foray. The two leaders exchanged a visit in April this year when Xi visited Trump in Mar-a-Lago. On that occasion, a novice American president was feeling out his main rival for global leadership. This was a getting-to-know-you opportunity. However, on this occasion more will be expected of a Trump-Xi encounter on issues like North Korea, concerns over China’s mercantilist behaviour, and its assertiveness in the South China and East China Seas. While it would be unrealistic to expect a “grand bargain” to emerge between the leaders of a new bipolar world, what is needed is some clear guidance about US priorities amid the confusion that has accompanied Trump’s nine months in the White House. Laying out some sort of vision for US engagement in the region should be a minimum requirement at a time of considerable uncertainty. The president can allay regional fears that the United States is commitment-phobic, by reinforcing at each step Washington’s allies and partners are the cornerstone of US engagement in the region. Reiterating the US commitment to freedom of navigation, free trade, and political freedoms will also reassure regional actors that it still makes sense to buy into a regional order underpinned by a US alliance system. Of course, this trip is only the first step in putting the United States on firmer ground in Asia, after many months of confusing signaling and disruptive initiatives. Expectations for Trump’s engagement with the region may be low, but the same could not be said for the stakes at a time of considerable uncertainty and risk. 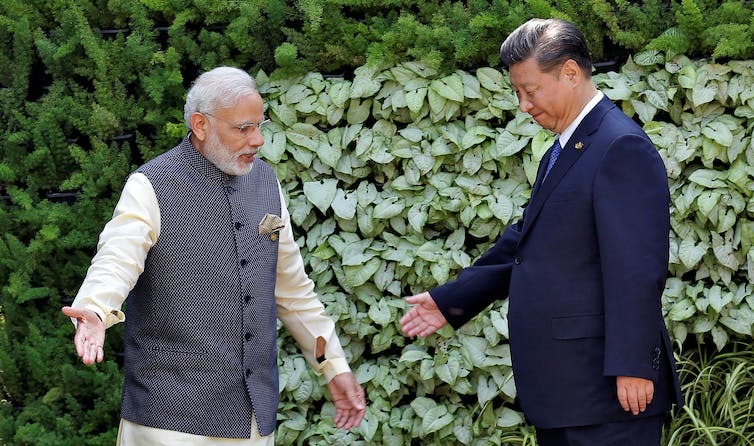 The standoff on the Doklam Plateau makes it difficult for either Narendra Modi or Xi Jinping to back down. The high altitude military stand-off between India and China at the Doklam Plateau, near the tri-border of Bhutan, India and China, is an acute example of how these old problems have been reinvigorated by Asia’s geopolitical flux. The Doklam stand-off is notable because it is in the north-east of the country. It started on June 16 when Chinese PLA engineers began work to extend a road that is within territory that is disputed between Bhutan and China, but in which Beijing has been operating freely since at least 2005. The work appeared to be an effort to extend the road closer to India’s border. In response, Indian military forces crossed the border on June 18 into what it regards as Bhutan – a country with whom Delhi has an agreement to guide its foreign policy – and prevented the road from being constructed. Neither disputes the basic facts – China was building a road towards India’s border, while India does not deny contesting PLA forces beyond its own borders – so what motivated their risk-taking? China’s claims that it was merely road building in its own land are disingenuous. It knows that the territory is in dispute with Bhutan and is acutely aware of Indian sensitivities. This was not just a bit of civil engineering, nor was it a case of a rogue PLA unit operating without central clearance. There has been far too much hyperbole about the prospects of this leading to a nuclear war – that is extremely unlikely – but it is also unlikely that this will end in a quickly negotiated diplomatic settlement of the kind that has resolved previous border stand-offs. Equally, the tension is a sign of Asia’s new contested and complex geopolitics. This is a world in which American influence is marginal – not just because US Asia policy is on autopilot – and one in which old and long running animosities have been revived by the combustible blend of ambition and wealth. The first week of July is not normally one that brings great events in world politics. Around that time, the northern hemisphere normally shifts into summer holiday mode. Recently, this has become less true. Coups in Egypt, Turkey, and a terror attack in France have bucked the trend. Asia’s early part of July 2017 has also defied the languorous tendencies of the seventh month. 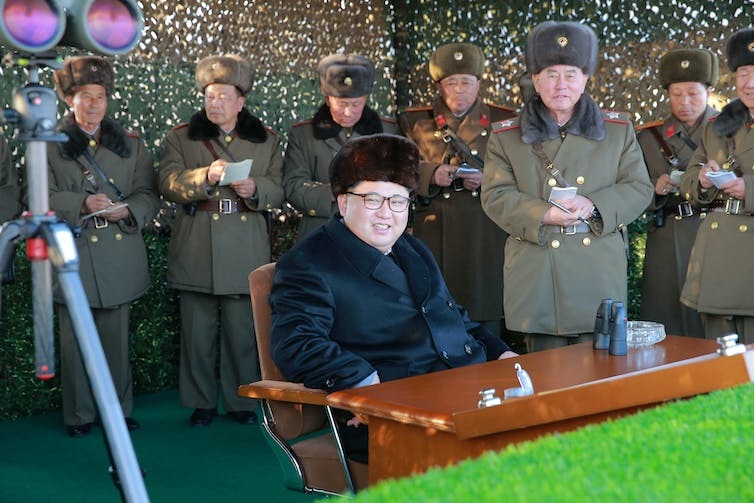 Presenting it as a gift to the US on its national day, North Korean leader Kim Jong-un proved his isolated country now has the ability to fling death and destruction across the Pacific. Contrary to US President Donald Trump’s declaration that it “won’t happen”, North Korea has successfully tested an intercontinental ballistic missile and is now within touching distance of a viable nuclear weapon capability. China’s approach to the 20th anniversary of the handover of Hong Kong sought to underscore Beijing’s power and prestige. But it only succeeded in reminding us of the party state’s insecurities and increasingly militarised approach to its regional dealings. The over-the-top martial parades, China’s first aircraft carrier sailing into the harbour city, and President Xi Jinping’s powerful warnings not to “use Hong Kong to carry out infiltration and sabotage activities against the mainland” made clear China’s intent to signal that it is firmly in charge of the upstart entrepot. However, Xi did so in a manner which reminds us of the party-state’s military instincts and its thin skin. In the Himalayas, China and India had another of their high-altitude standoffs as Chinese military engineers constructed roads and buildings in territory that is disputed, as well as in land that no one regards as anything other than Bhutan. Tensions have escalated, with China’s ambassador in New Delhi reminding India of the “bitter lesson” of the 1962 border war. And in the South China Sea, the US deployed B1 bombers to fly over the disputed features – much to China’s chagrin. The Trump administration stayed its hand in trade and the South China Sea in the belief China could restrain North Korea. But North Korea’s test shows the White House either that Beijing wasn’t trying hard enough, or that it does not have necessary leverage over Pyongyang. Either way, the Sino-American relationship, which had seemed in reasonably good condition following the “citrus summit” at Mar-a-Lago, is entering a much more difficult phase. It is hard to recall a time at which Asia’s geopolitical circumstances have been this fraught – at least since the 1970s. The region, which had enjoyed one of the most settled strategic circumstances, is now in a period in which its great powers not only don’t trust each other but are beginning to contest one another’s interests militarily. Over the past 40 years, American leadership has been vital to Asia’s stability. Its dominant military power provided public goods and kept regional rivalries in check. Economically, it provided much-needed capital, and its large home market was open for export opportunities. But US leadership is visibly waning. The credibility of US power and influence is openly questioned while its economic openness is also in doubt. Rising powers realise this and are jostling for advantage. In response, defence spending is on the rise, as countries take steps to secure their interests in an increasingly uncertain world. North Korea’s intercontinental ballistic missile test is only the most visible example of a region that is arming itself in the face of a shift in the balance of power. Declining US leadership predates Trump’s election. But the sense of uncertainty has been badly exacerbated by the absence of a coherent Asia policy from his no-longer-new administration. US policy in Asia is largely on autopilot, with the direction set by the Obama administration remaining in place. But this is due to inertia; it is not a considered strategy. If this continues, it will amplify the destabilising actions taken by those across the region who are unsettled by this uncertainty. China’s position in the region is changing swiftly. Its gains in the South China Sea are unlikely to be reversed, and its infrastructure initiatives – both the Asian Infrastructure Investment Bank and the Belt and Road Initiative – are being widely welcomed. Equally, China has taken the opportunity of Trump’s unwillingness and inability to lead to present its rise as a positive force on a range of issues – most obviously on climate change and the global economy. Indian Prime Minister Narendra Modi’s globe-trotting efforts to build the country’s reputation has seen him complete more than 60 trips abroad since his election in 2014. While there is some way to go to turn his ambition for India’s international heft to match its demography and civilisational legacy, it is modernising its military capacity and expanding its international influence. As the standoff with China shows, it will be no pushover. Crucially, India sees the current period of flux as one of historic opportunity. The region’s lesser powers are also playing their part in this geopolitical drama. Like Modi, Japan’s Shinzo Abe sees opportunity in these circumstances. He is pushing for Japan to be able to do far more militarily – something that is contentious at home and abroad. And even with its very limited capacity, Japan is proving a thorn in Chinese ambition. Many others, such as Australia, the Philippines and Korea, are positioning themselves in relation to a larger contest for influence in Asia. For decades, Asia’s countries took comfort from a stable balance of power underwritten by US might and economic openness. This allowed rapid economic growth. But that wealth is now powering ambition that, when paired with America’s declining influence and sense of purpose, has created an increasingly unstable Asia. Unfortunately, there will be many more months and weeks ahead like July 2017’s first week.